Storage tanks are a common and crucial piece of infrastructure for the modem economy. 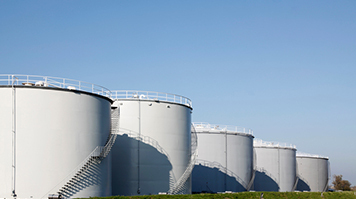 The majority of active storage tanks hold crude oil or a derivative of it which, in the event of a tank failure, is potentially extremely hazardous to the environment - just one gallon of oil can contaminate a million gallons of water. Unfortunately oil storage tank failure is relatively common, accounting for over 80% of total incidents. Of these incidents 20% are caused by cracks, ruptures or corrosion. Thorough and regular inspection reduces the physical and financial risks but the standard physical inspection process is a costly and time consuming process. Tanks need to be shut down, cleaned and vented before inspection can be carried out at a cost of about £500,000 per tank. Researchers at LSBIC have developed a robotic platform, TankRob, a non-destructive inspection robot. The robotic crawler uses ultrasound to scan the tank surfaces for defects and corrosion, reducing cost and risk. The prototype has already been demonstrated in water tanks and its performance indicates enormous potential. The system needs to be enhanced to produce a commercial version that will obtain the necessary certifications and its performance to be validated on oil storage tanks. Obtain ATEX certification so that Tankrob can carry out in-service inspections. 100 per cent inspection coverage provides operators with detailed structural integrity information, thereby increasing tank safety, reducing the risk of tank failures. Read more about London South Bank Innovation Centre and the various robots being developed there.